The prevailing conditions of our world today are the source of much fear, anxiety, disillusionment, frustration, insecurity, and depression. The political leaders, social architects, economic gurus, scientific wizards, educational professionals, and philosophical geniuses seem to be bankrupt of ideas to respond to the global challenges. The 21st century seems to have led our planet on a course toward self-destruction like a galactic space ship without a compass. It seems like all our technological, scientific, and social advancements have not been able to solve our human problems. The reality is that today there are more wars and conflicts than in any other time in history. We have invented everything, except a way to solve the disease in the human heart. The result continues to be political corruption, economic insecurity, racial strife, ethnic cleansing, escalating violent crimes, drug wars, the proliferation of gangs, and religious wars. What is the answer to the global dilemma? The answer to our future is in an ancient language, a language that invaded earth at the beginning of creation. We need a revival of the language of love, grace and mercy. Don Milam's The Ancient Language of Eden, in his very simple yet profound way presents a fresh look at a subject that the 21st century world is dying to receive. In this work, Don leaps over complicated theological jargon and presents the fundamental precepts of the missing ingredients for our world today. The overworked concept of love is once again placed back into its divine context so that we can speak the language of God again. His treatment of the "grace factor," is superb and will drive you back to the heart of God for more. His exploration of the concept of "mercy" is a missing component that even the church needs to rediscover. This book is destined to be a classic and should be read and in the library of every individual who desires to find answers to the many challenges of our postmodern world. I highly congratulate Don on another masterpiece and see it as a timeless contribution to this and future generations. The Ancient Language of Eden takes you on a unique journey back in time to the beginning of all things. You will fly on the wings of grace into the arms of Jesus where you will rediscover your native tongue — the language of grace, mercy, and love. You will also weep as you learn how the code of religion with its clichés, cliques, and corporate structures destroyed the old language. In the end, you will emerge into Eden's bright light, speaking again the sweet words of that ancient language. In that ancient garden, at the edge of time, you will discover the forgotten language. There in that garden palace you will also experience the passion and power of the early days of life in Eden before the primitive language was corrupted and eventually lost. Donald L. Milam, Jr. and his wife, Micki, graduated from Prairie Bible College in Alberta, Canada, in 1968. Right after their marriage they joined the staff of Philadelphia Teen Challenge. After two years, they exchanged the streets of Philadelphia for the streets of Maputo, Mozambique, in East Africa, where they opened a drug rehabilitation center at the request of the Portuguese Department of Health. When the communists took control of the country in 1975, Don was arrested and spent ten months in prison. Following his release, Don pastored for ten years in Pennsylvania. He and Micki presently work with Destiny Image Publishers. They have three wonderful children: Kelly, Andy, and Jeff, a son-in-law, a daughter-in-law, and five much-loved grandchildren. 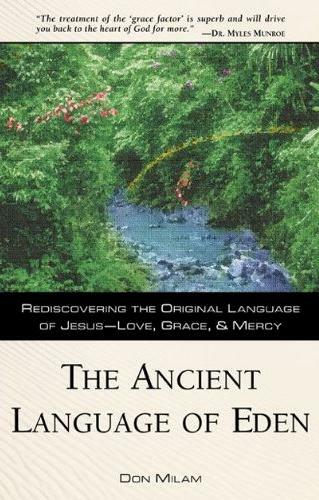 The following is an excerpt from the book, "The Ancient Language of Eden" by Don Milam. Buy your INEXPENSIVE books at one of these sites: Amazon, Alibris, Abebooks. Henry Drummond, perhaps best remembered as a gifted evangelist who assisted Dwight L. Moody during his revival campaigns, also was a lecturer in natural science. In his talks, he discussed the three laws of natural science. I believe these laws help us with the question, "How does a man change his life?" The three laws are: 1. The law of motion, 2. The law of assimilation, and 3. The law of influence. Since I read these laws, I have been helped immensely in understanding the nature of spiritual growth. This knowledge greatly relieved still-hidden frustration in my growth process. The clay is totally dependent on the hands of the Potter for the shaping of its existence. Only the Potter has the picture of the finished vessel in His mind. Unfortunately, what most of us have done is tried to get the clay to mold the clay -- be it our own clay or someone else's clay. That's how we end up with misshapen pots. We must come to understand that changing a life is dependent on the forces in the spirit far beyond our puny efforts. What are these impressed forces? Glory is an impressed force. "But we all, with unveiled face, beholding as in a mirror the glory of the Lord, are being transformed into the same image from glory to glory, just as from the Lord, the Spirit" 2 Cor. 3:18. We live in a time when there is a lot of talk about the glory of God. What exactly is the glory of God? Remember Moses on Mount Sinai having a personal tête-à-tête with God? Moses had the outrageous courage to ask God to show him His glory. Rather brash, don't you think? However, God gave him his wish. He told Moses to squeeze himself into a big crack in a rock, and then God put His Hand in front of Moses to keep His glory from incinerating him on the spot. Then Moses heard these words as the Most High passed by: "The Lord, the Lord God, compassionate and gracious, slow to anger, and abounding in loving kindness and truth; who keeps loving kindness for thousands, who forgives iniquity, transgression and sin" Ex. 34:6-7. The glory of God is found in the essence of who He is. God is love. God is grace. God is truth. Glory is not some ethereal, nebulous thing. It is very substantial and visible. It is substantial in the character of Christ's life, and it is visible in His acts toward man. 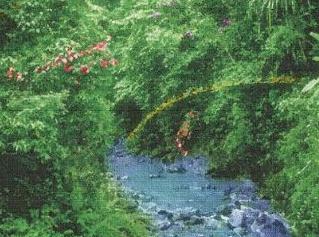 The first Adam had the privilege of living in the glory of God, as he was always in His presence until he left the garden. The second Adam, too, lived in the Father's glory, but He shared it with Father. He laid it aside for a time while He lived among us, but it is once again His. As we continuously read about and reflect on the grace and glory of God, we are promised that we will be transformed into that same image, from glory to glory. Drummond declared that "all men are mirrors." Our lives reflect the nature of the things we observe. As we experience God's grace in our lives and are changed from glory to glory, we are called to mirror that grace to others. Suffering also is an impressed force. I realize this is a subject no one likes to talk about, and I confess it is not one of my favorite friends, but I have discovered that it doesn't have to be my enemy. This is probably one of the greatest struggles in the heart of man, be he believer or atheist. Again and again, you hear the charge leveled that if God really was love, there would be no seemingly random suffering in this world. Like it or not, it is the calamities of life that push us, sometimes drag us, toward the place of change. We have all experienced the bewilderment that occurs when blessings seem suddenly to be suspended and we have no sense of His presence. We cry out for an explanation, and the heavens are as brass. We hear nothing. The trauma of losing someone we love, the drying up of finances, and the pain of sustained physical illness -- we can all remember crying out to God for deliverance or at the very least, some kind of answer. Life is hard -- we don't get that promotion we hoped for or we are laid off a job, our children drift away from us, cancer strikes us down. Yes, suffering is an impressed force. Many of us were led to believe that Christians would not have to suffer like those in the world. It didn't take us long to find out the error of that belief. We have found out that we experience the same pain as those who don't know or don't love God. But even knowing that, we still suffer shock every time we are knocked up side the head with a new disaster. We still tend to react in anger toward the Lord because we know He could shield us from all these horrible things if He wanted to. I read somewhere years ago, that we never learn anything new without pain. That truth comes to us in a negative form that we usually resist. After giving that some hard thought, I had to admit it had probably proved true in my life. Equally correct is that in passing through the valley of the shadow of death, the dark night of the soul, we discover a brokenness within us, a good brokenness, and a new sense of closeness to the Lord. In the shattering of our peace and our dreams, we often discover new truths never before known. We find that the night became a pathway, a birth canal if you will, into a place we have never before been. We never could have reached that place unless we walked through the dark regions. It was only much later in my life, after a couple of more devastating blows, that the light dawned. My spirit had been enlarged. It was deeper and wider, and fuller than it had ever been and I didn't even seen it happening. Most of us have very puny souls, like muscles that seldom get exercised. The materialism and self-centeredness of this age have caused them to wither up. But when our lives collide with the impressed force of suffering, those muscles begin to enlargement. Again, the Psalmist of Israel, who had suffered so much put it this way: "Answer me when I call, 0 God of my righteousness! You have relieved me in my distress; be gracious to me and hear my prayer" Ps. 4:1. The Hebrew word for distress means "trouble" or "pressure," and the word for relieved is "enlarge" or "make room for." So David was saying what we were just saying -- In pressure you have enlarged me. Trouble can become a friend in God's Hand. We are not called upon to enjoy pain, but to endure it, understanding that in the pressures of life we are being transformed into the image of our beloved Jesus, who also suffered. Peter said it this way, "To the degree that you share the sufferings of Christ, so that also at the revelation of His glory you may rejoice with exultation" 1 Peter 4:13. We hold in permanent preservation the things that we reflect --- this is the power of the law of assimilation. By what power do we retain those things upon which we reflect? In computer lingo we say, "garbage in, garbage out". Input into a computer is retained in its memory banks for immediate access. Man is a living computer. There is a wealth of memories stored within us -- truths we have learned, experience we have had, people we have met, words we have heard, places we have visited, sounds, smells, and so on. Just like a computer, our memory banks are not selective, in that they hold the good, the bad, and the ugly. These memories are not simply stored in our minds -- they have gone into our very psyches and shaped us the way we think, the way we feel, and the way we act. There are many forces in each of our lives that we have no control over. Stuff happens. We are, however, responsible for a lot of the other forces that impress us. There is a saying, "You are what you eat." While that is true, it is also true to say: "You are what you read. You are what you listen to. You become like those you hang out with." I don't want you to think I am talking about the old tenets of the code that seek to legalistically regulate us. I am just saying that sometimes hanging with "bad" people can exert a powerful impression on our souls. Some times associating with the so-called "good" people can have an equally negative influence on us. Look at the people Jesus hung out with. He seemed to prefer the company of the rejects of society to that of the religiously "good" of His day. So labels don't mean anything. Being sensitive to the cursor of the Spirit pulsating on the screen of our hearts should be our guide as to what we're inputting into our souls. We want to be directly under the loving influence of Jesus --- hearing His voice, reading His words, contemplating His life. As we do this, He will explain the Father to us. We will be drawn into that intimate circle that Jesus promised was our rightful place -- right there with Him and Father -- and be changed into His image without even trying. Paul's driving passion was to draw others into this lovefest he had discovered. As His own character was being transformed into the nature of God, an urge was burning within him to nurture that life in others. "My children, with whom I am again in labor until Christ is formed in you" Gal. 4:19. No man is an island. No one exists in this life in a vacuum. Therefore, we are all results of the influence or impact other people have had on our lives, for good or for evil. Those who have been abused, ridiculed, scorned, or rejected bear deep wounds in their souls. The real tragedy is, they have become those wounds. They are damaged people who will, without a divine intervention, damage others. Then on the other hand, there are those who have only known acceptance and love and have become sources of love and light to others. Drummond spoke of the powerful impact Jesus had on His ragamuffin disciples. A few raw, unspiritual, uninspiring men were admitted to the inner circle of His friendship. The change began at once. Day by day we can almost see the first disciples grow. First there steals over them the faintest possible adumbration of His character, and occasionally, very occasionally, they do a thing, or say a thing that they could not have done or said had they not been living there. Slowly the spell of His Life deepens. Reach after reach of their nature is overtaken, thawed, subjugated, sanctified. Their manners soften, their words become more gentle, their conduct more unselfish. As swallows who have found a summer, as frozen buds the spring, their starved humanity bursts into a fuller life. They do not know how it is, but they are different men. One day they find themselves like their Master, going about and doing good. To themselves it is unaccountable, but they cannot do otherwise. They were not told to do it, it came to them to do it. But the people who watch them know well how to account for it. "They have been," they whisper, "with Jesus." Already even, the mark and seal of His character is upon them. "They have been with Jesus." Unparalleled phenomenon, that these poor fishermen should remind other men of Christ! Stupendous victory and mystery of regeneration that mortal men should suggest to the world, God!